Highly skilled, trained kitchen planners in store and on the phone to discuss your project and turn your ideas into reality, using the latest CAD Design Technology. We have some of the most competitive prices in the market on our high quality kitchen range. So you won’t have to break the bank for your dream kitchen. All of our kitchens are designed and manufactured right here in the UK in a cutting edge 315,000 sq ft facility. 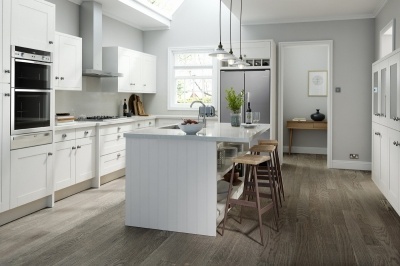 We run promotions every quarter on our kitchen ranges, offering up to 50% off certain kitchens! Call or visit us in store now to find out the latest deals. All our kitchens are backed up by a 10 year manufacturers warranty. So you can rest assured that you are investing in a quality product that is built to last! From the first liaison with Scott (Pearson) in his expertise of the initial design, to his help, support and project managing of the kitchen – to Scott (Black) at Ebony Joiners providing outstanding diligent craftmanship. All of course would not have been possible without the excellent quality of products supplied by Orchard Timber in transforming into a first-class kitchen! Pick your dream kitchen from our fabulous Chippendale Kitchens Brochure, online at www.chippendalekitchens.co.uk or pop into our Kitchen Showroom in Livingston or Forfar. What colours and textures do you like? Decide on the doors, cabinets & handles that you like? What appliances do you want? Measure your kitchen room dimensions, remember to include all doors, windows, pipe boxes and the location of the mains water supply. What would be your ideal layout? Once we have all the information on your “Wish List”, we will design your new kitchen on our state of the art CAD Design system for you. When you are completely happy with the Kitchen Drawings & Plans, we will then give you a no obligation quote. If you are 100% satisfied with your kitchen quote and layout and would like to proceed with your order, please let us know and we will do the rest. Availability for standard kitchens is 7 – 10 days and 3 – 4 weeks for our painted collection range. We always like to do a final site measure to ensure that everything fits perfectly.